The gradients are finally gone today as you trek through fine sandy beaches on route to the largest dunes Nature Reserve in the country, full of wildlife and the gateway to the mighty golden Taw and Torridge estuaries that will dominate your final days of walking. 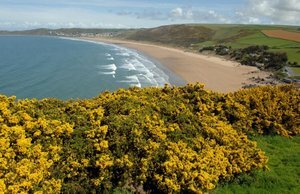 Lose yourself along fabulous Woolacombe Sands this morning or choose to wander inland through the enormous dunes at Woolacombe Warren home to large populations of rabbit and one of the best places for spotting adder. Then a brief return to rocky promontories and grassland at Baggy point whose near vertical cliffs are a hugely popular climbing destination. Look past the herring gull, fulmar, shag, and shearwaters for the closest and best views of basking seals along this stretch. The pleasant surfing beach at Croyde a picturesque place gives a good lunch stop, now Devon’s most sought after surfing beach where the laidback surfers' lifestyle collides head on with the thatched roofs and tea shops of the pastoral Devon of the past. Those wanting a dip can join the wave riders for an hour or so on your way through and catch some thundering water – wetsuits and boards available for hire here. 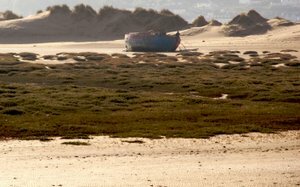 This afternoon the South West Coast Path passes through Saunton Sands and the Braunton Burrows Natural Nature Reserve. Said to be the largest dune and mud flats system in the UK it holds World Biosphere Status from UNESCO for its unusually fine sands created by centuries of crushed shells. Wildlife is everywhere here foxes; hedgehogs, rabbits, moles and other mammals thrive amongst over 400 recorded species of flowering plants. Above you watch for Buzzards, skylarks, stonechats, Kestrels and an array of butterflies swoop above the dunes. The whole area was an important location during rehearsals for D-day by the US Army who used it as an Assault Training Centre depositing thousands of troops from amphibious vehicles here and you walk along a dune track still known as The American Road, skirting a military danger area where Mock landing craft can still be spotted. Rounding Crow Point you finally reach the mighty River Taw and you can follow a well placed boardwalk out to dip your feet into the estuaries waters through low marshy meadows and sand and mud flats amongst flocks of curlew, red shank and even spoonbills The panorama is wonderful, on the opposite bank and tantalisingly close is Appledore only around 1000 feet away but yet a full days walk for you inland via Barnstaple and Bideford until you can ford the estuary to head back out here. Following the compact River Caen inland you pass the former port at Velator Quay terminal in past days for welsh coal and limestone to reach Braunton.